Holidays and indulgent recipes go hand-in-hand, so it’s little wonder that so many people lose sight of their health and nutrition goals during the Thanksgiving and Christmas season. But not all is lost! It’s worth keeping in mind that if you start your day with food that is a good source of fiber, such as avocados, you’ll feel fuller for a longer period of time, discouraging you from overeating at all the holiday office parties. Avocado has 11% of the daily fiber you need, and it has a number of other nutritional benefits, too. One serving of avocado has 80 calories, it’s a source of good fats(6 grams of mono and polyunsaturated fats in 1/3 a medium avocado), and nearly 20 vitamins, minerals, and phytonutrients. And equally good news? Avocados From Mexico are available all year long, which makes them easy to find and use (and eat!) during the holidays. 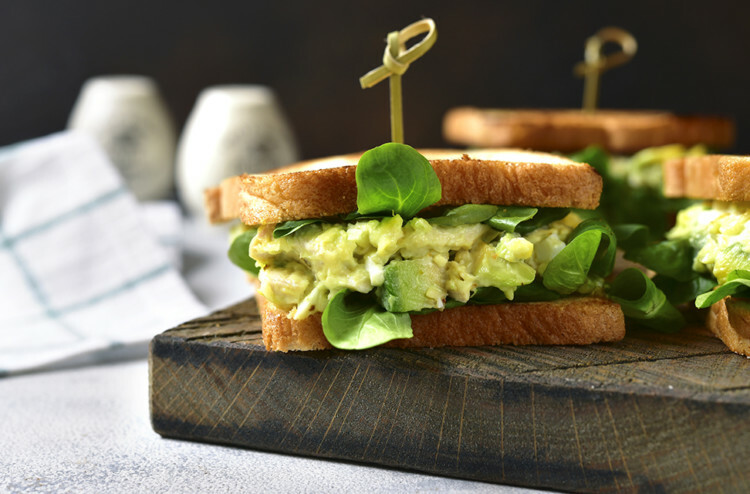 These avocado egg-salad sandwiches are easy to make and are packed with all the benefits of Avocados From Mexico. To make these delicious treats, boil 4 eggs for 10 to 12 minutes, drain, and cool under ice water.Once cool, peel and chop the eggs and mash together with 1 avocado. Add onion, mayo, mustard and dill to taste. Season with salt and pepper. Slice the French bread in half and spread the mix evenly on each slice. Add some slices of tomato and alfalfa sprouts for some extra flair. Now you have a delicious plate to share and enjoy with family and friends for the holidays.